1. First of all, and this is the one I want you to know for sure… Although there are 4,000 (!) species of bees in North America, the honey bee is NOT native to North America. Some list the date of 1622 for honey bees’ first arrival in North America. They are an invasive, though quite beneficial, insect. 2. The most popular races of honey bees in North America are Italians (described as very gentle), Caucasian (a dark bee that makes tons of honey and propolis as well), and Carniolans (a gentle bee that can handle long winters). I have Carniolans. 3. 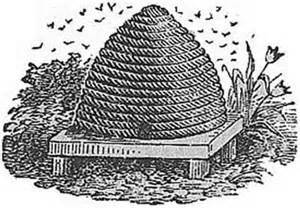 The familiar, old-fashioned beehive is called a skep. It was made of straw or grass and the bees built their honeycomb inside. Skeps are outlawed in the United States, although still legal in the UK, because it is not easy to inspect the hives for disease and pests. The hive must be destroyed to harvest the honey. 3.5 Don’t forget… this inspired a fashion trend with the beehive hairdo!!! 4. Bee gums, which were popular on the east coast, were hollow logs from the black gum trees which were set in “bee yards” and like skeps, were destroyed when honey harvest came along. 5. 75% of the world’s beekeepers or “beeks” use Langstroth hives which were developed by Rev. Lorenzo Langstroth in 1860. These are the white stacked boxes you may see near fields and pastures. They use standardized preformed frames and hive bodies, so that honeycomb can be removed and new frames added without much disturbance to the hive. It revolutionized beekeeping. 6. Honey bees are led by a queen. Soon after leaving her cell, the new virgin queen kills the other queen larvae which haven’t left their cells yet. She then flies, mates with several drones (who die in the act), and swarms with her worker bees to form a new hive. She then can lay up to 2,000 eggs per day. 7. Eggs are laid singly, each in its own cell. Larvae molt several times, then spin a cocoon and pupate. They then are fed pollen. Young bees are called “nurse bees” and take care of the larvae and clean the hive. As they age, they begin making beeswax cells and defending the hive. Finally, she will become a forager. 8. Besides honey and beeswax, another product of bees is called propolis. It is the “glue” they use to seal up the cracks in the hive. It’s a great reason to have a hive tool, prying up boards bees have glued with propolis takes some leverage! Propolis is said to have beneficial properties ranging from affecting canker sores to cancer. Propolis was supposedly used by Stradivari in the varnish of his instruments. 9. Honey bees will sting to protect their hive. The bee that stings also dies, because the stinger is torn from its abdomen. The stinger has its own muscles, so it will continue to pump venom into your skin even though the bee has fallen away. Scraping the venom sac instead of pinching it to pull it out, and thus pushing more venom into you, is the preferred method of removal. The bee has also released pheromones which tell other bees to join in the attack. It’s then best to leave or cover the smell with something strong like rubbing alcohol. 10. Honey is regurgitated by bees multiple times. Even then, there is too much water in the honey. Do you know what you get with watery honey (and airborn yeast)? MEAD. Someday, I may make some… honey wine… sounds WONDERFUL. Anyway, the bees want honey and not mead… so they sit atop the honeycomb and fan their wings. Yes, they actually dehydrate it to the proper level, drying out their honey. They then cap it with wax, sealing it up! That’s about the coolest thing I’ve learned about bees… although I’m still learning, believe me! This is one of the funnest things I’ve ever done… so I’d encourage you to try beekeeping. The rewards are SWEET! I second what Marilyn said: the information you wrote is fascinating, a window into yet another facet of animal husbandry. You do a terrific job of introducing your readers to the biology and keeping of bees. Please keep up the good work. I’d love to hear what your bees favorite nectar and pollen plants are as they come into flower. This is an excellent blog – thank you. Thank you for all the information you compiled about bees – it is very interesting to me… and totally fascinating. Wow, 4000 species of bees in North America alone! Let’s hope yours do well to provide some delicious home-grown honey and maybe some mead for you. This is really interesting. Let me know when you start the mead making. Very fascinating! Thank you again for your daily informative notes about life at the ranch! WOW!! Such a lot to learn. Didn’t know even half. As a side note, Tank and Lark got together yesterday. Trying again this morning. Pups around May 26th. Thanks Carol for this bee information. No wonder they are called busy bees. It must be wonderful to taste your honey once harvested. Hope it’s a great summer for you and your bees. Look forward to hearing how they get on in future posts.